On Thanksgiving, the hub of the holiday is the table. It’s where everyone gathers to share a special meal and give thanks for each other and all of their blessings. 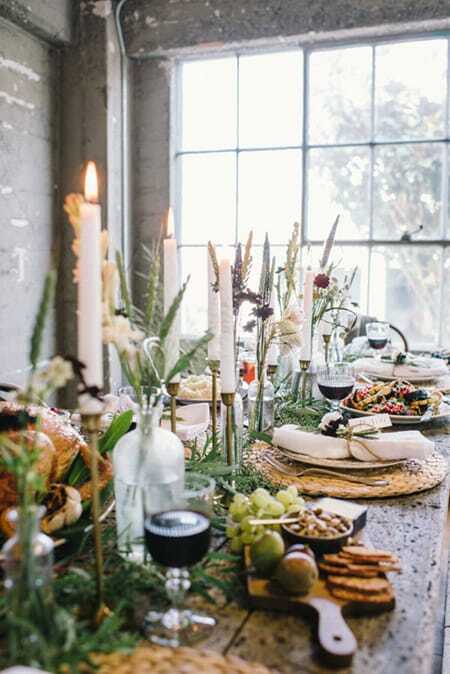 While there are many places in your home you can add a festive flair to for Thanksgiving, the table is the most important spot to adorn. 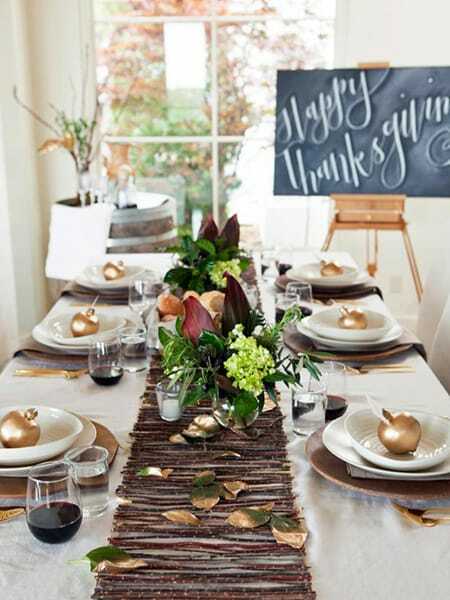 By creating a beautiful Thanksgiving tablescape, you can enhance the experience for everyone. It doesn’t take a lot to make it special. 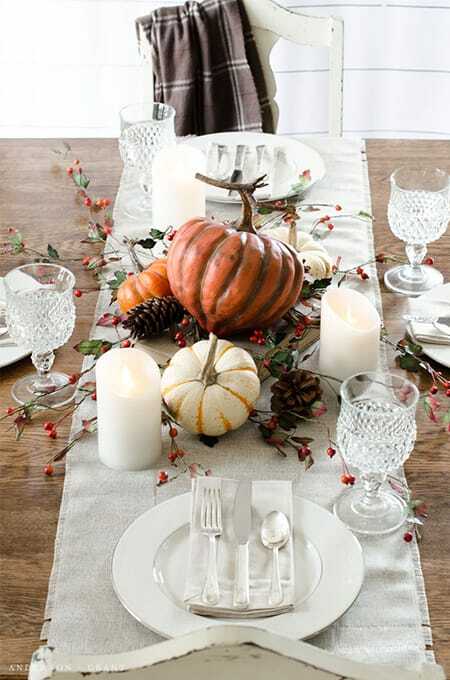 Even just a simple, beautiful centerpiece can delight your guests and help get everyone into a festive mood. 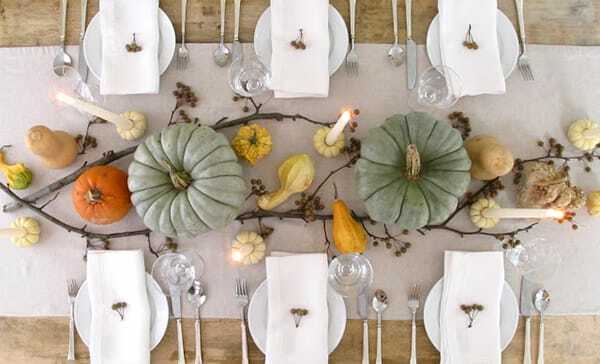 Whether you want to go all out and make a glamorous setting or prefer something casual and subtle, here are some inspiring ideas for a Thanksgiving table that will delight your guests. 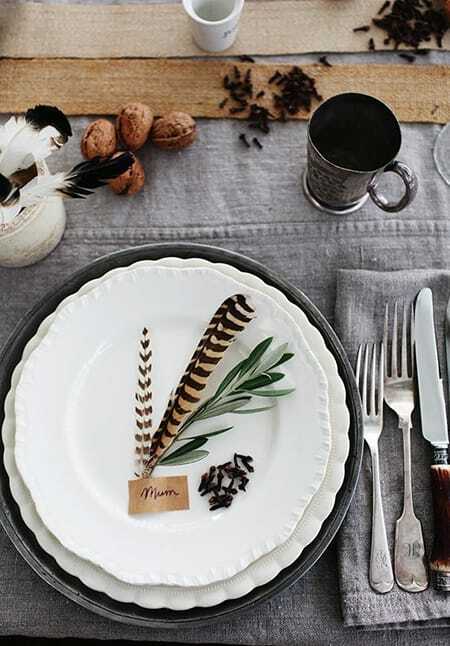 This Thanksgiving tablescape is the perfect balance between rustic and glamour. 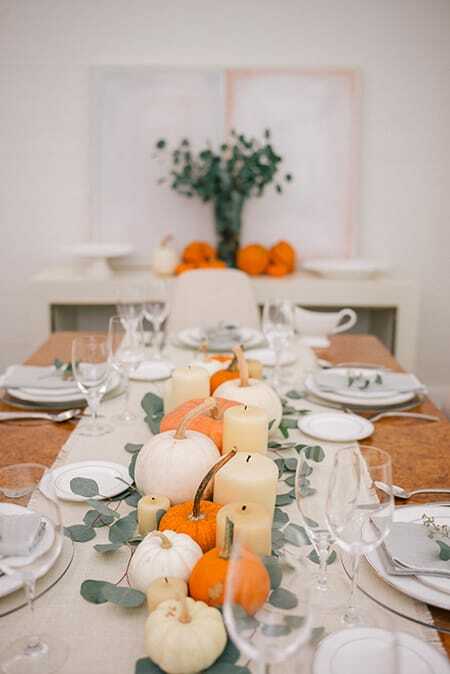 Colorful pumpkins, gourds, and branches make up a simple yet chic centerpiece. 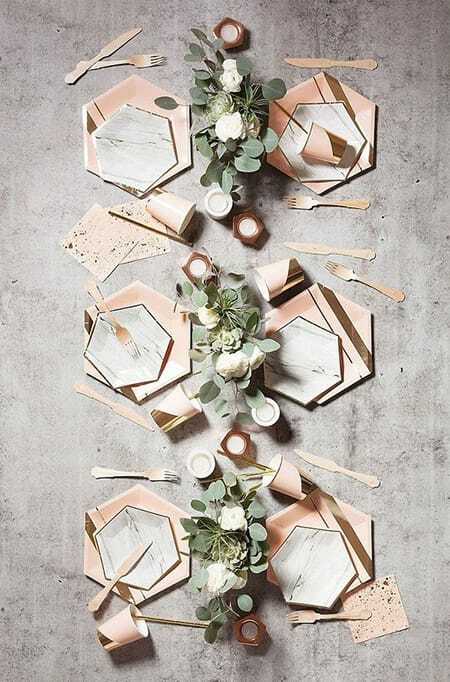 Don’t be afraid to think outside the box with your tablescape and get artsy with it. 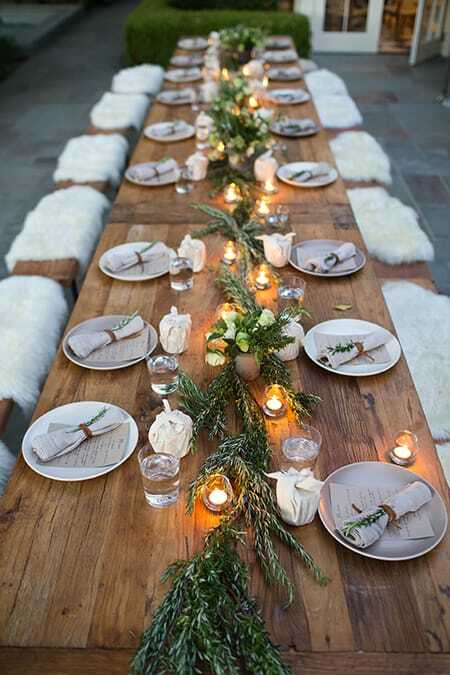 Wildflowers, candles, and a wood table make this tablescape look like it came straight from the forest. For an elegant look, muted green and neutrals are a beautiful option for the holiday. 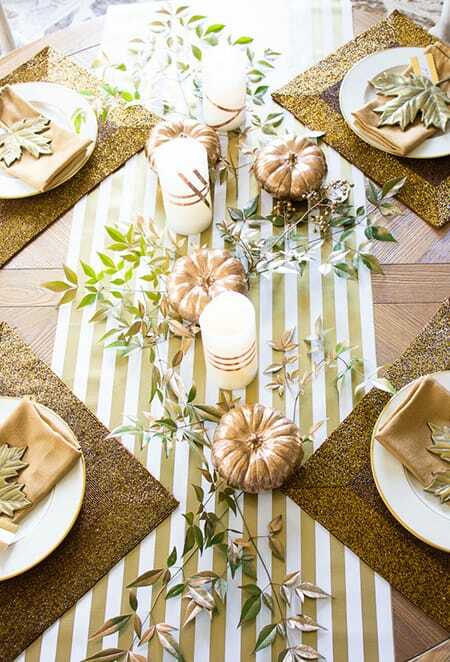 Touches of gold are a great way to add a bit of glamour to your Thanksgiving table. 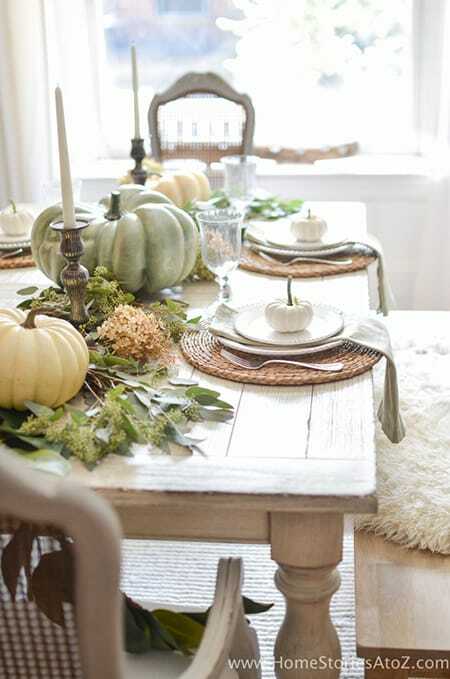 Keeping everything neutral and muted except for a few orange pumpkins made them stand out and look extra chic. Denim is an unexpected but fitting textile to use for a casual, stylish look. By keeping the place settings white, the centerpiece instantly draws your attention. This tablescape fully embraces the sparkle and glamour of gold. Planning to throw a little girl’s birthday party or a fabulous dinner party for you and your friends? Then you need the perfect desserts! One of my favorite parts of planning a party is deciding what creative, delicious treats I’ll be serving. There are so many fun ideas out there to make it extra special. Some of my favorites are the feminine dessert ideas. It’s fun to embrace your girly side, especially with something sweet. There are a ton of DIY dessert ideas out there that will keep you inspired and delight your guests. After all, who doesn’t love cute things that also taste delicious? 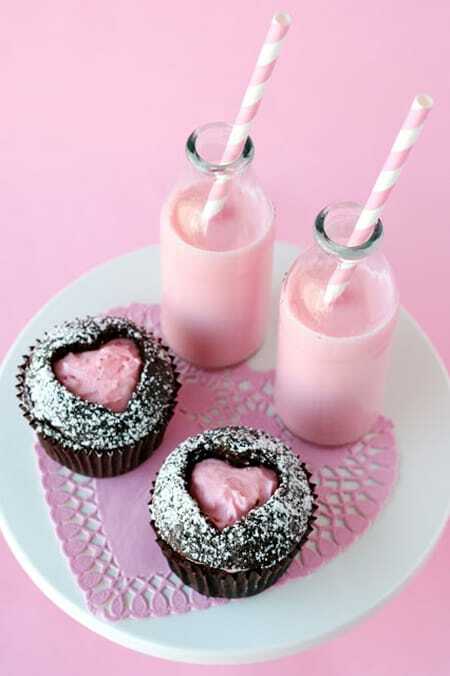 Here are 10 girly dessert ideas with DIY tutorials that you can have a ball making. 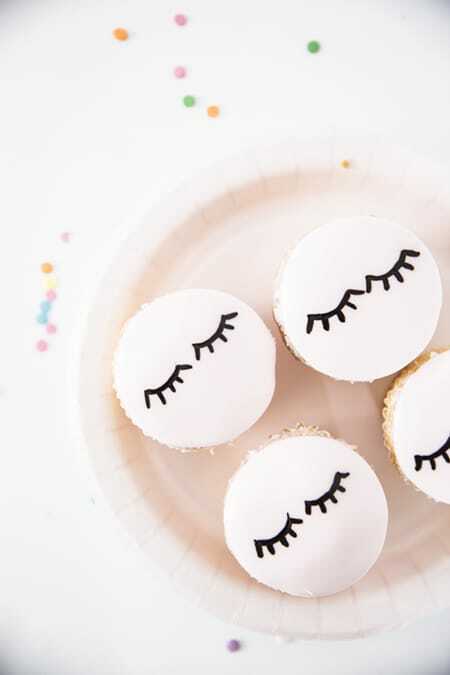 How charming are these eyelash cupcakes? They’re as easy to make as they are adorable! These sweetheart cupcakes are full of a delicious surprise. What’s better than an ice cream pop? 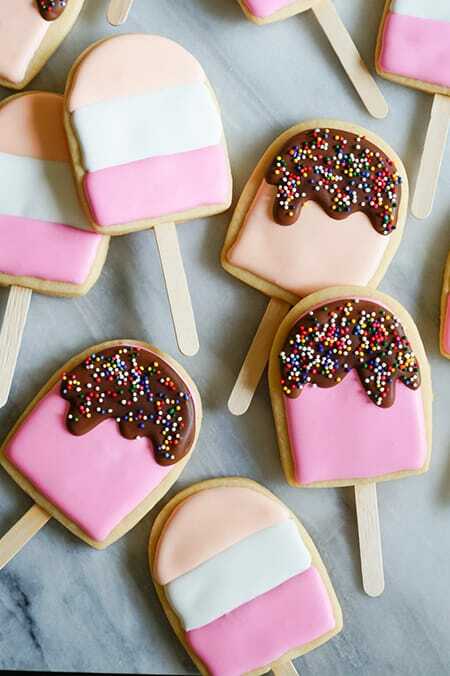 Ice cream pop cookies! These magical unicorn is hiding a healthy treat: a strawberry! 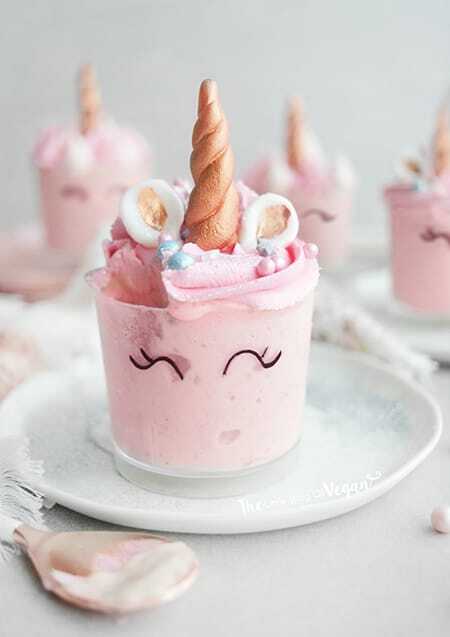 If you love unicorns, here is another adorable dessert idea with banana and coconut. 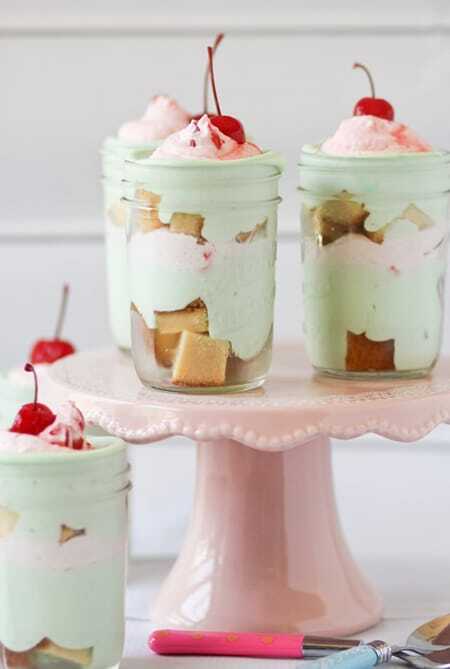 Here’s a delicious mason jar treat, Spumoni Trifles, that make the perfect summer snacks. 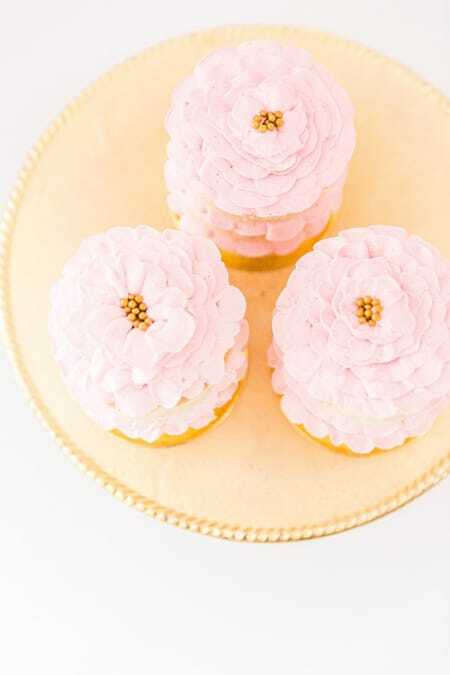 How stunning are these flower-inspired cupcakes? Talk about a sugar overload! 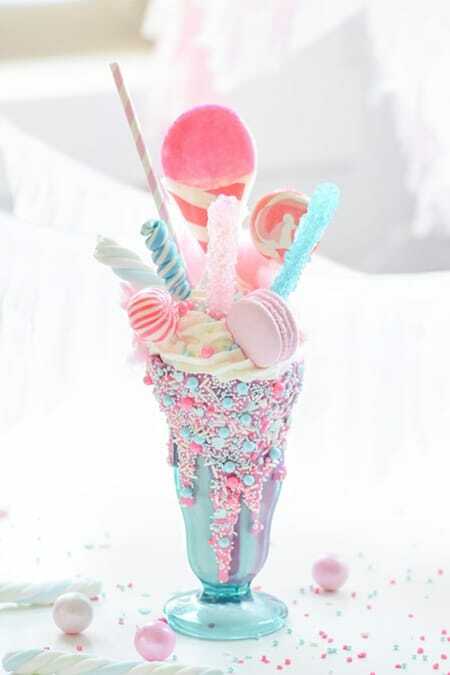 This gorgeous cotton candy freak shake is about as Instagrammable as it gets. Brunch anyone? 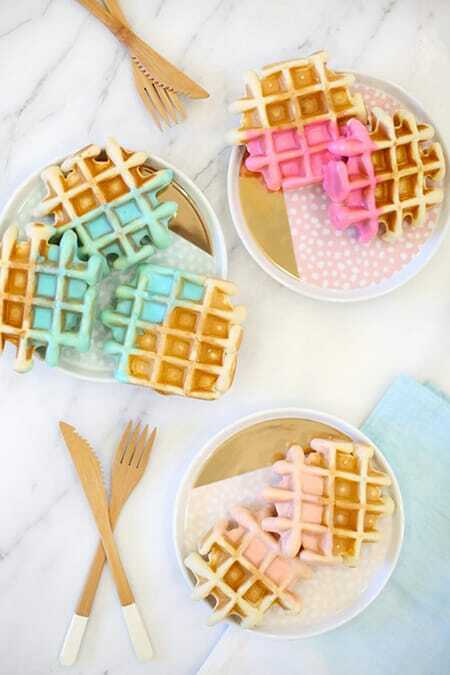 Try these color-dipped waffles. 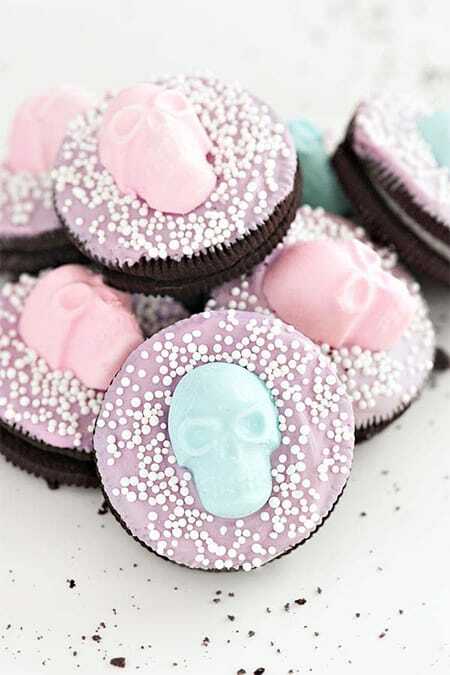 Give your party a spooky but feminine twist with these adorable skull Oreos. Which ones are you most excited to try making? Unicorns have always been universally loved, but they’ve recently seen a surge in popularity as a trend that doesn’t seem to be slowing down anytime soon. You can find them in everything from fashion and home decor to food and parties. I can’t think of a more magical, happy concept than a unicorn-themed party. It’s all about bright colors, joy, and embracing our unique brand of magic, whatever that may be. Unicorns are a great representation of individuality. Who wouldn’t want to attend a unicorn-themed party? 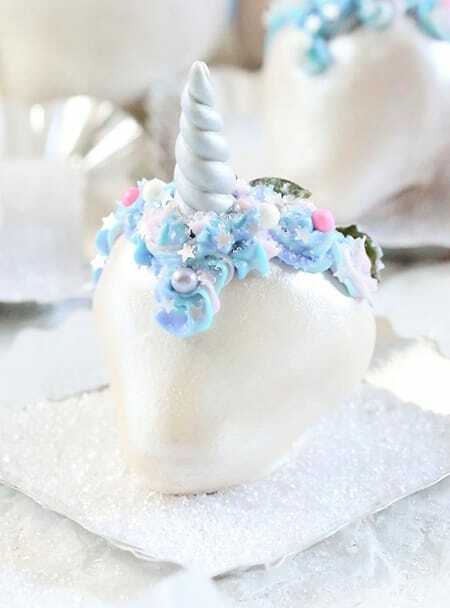 There are tons of wonderful ideas out there to inspire your own party, so I’ve gathered some of my favorites with easy tutorials you can follow to throw your own unicorn-themed party that your guests will absolutely love. They include everything from savory treats to decadent desserts with a whole lot of color and fantasy thrown in the mix. 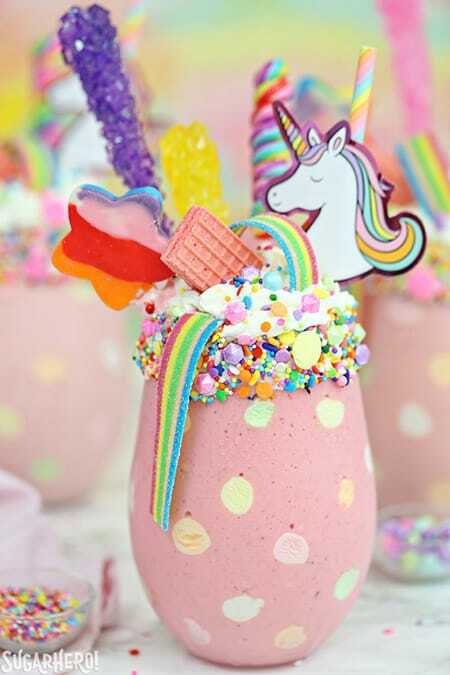 This unicorn milkshake looks like an explosion of happiness and good things. 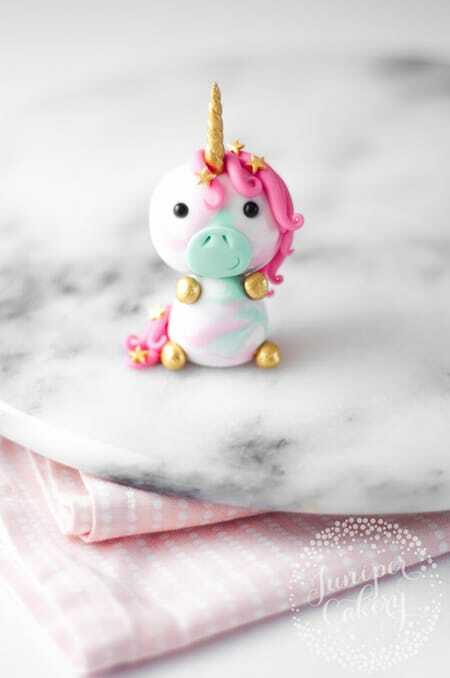 How unbelievably adorable is this fondant unicorn cupcake topper? 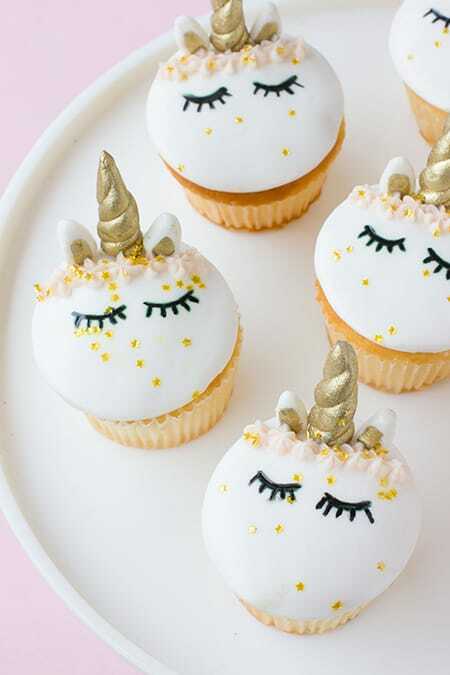 These unicorn cupcakes are almost too pretty and adorable to eat. 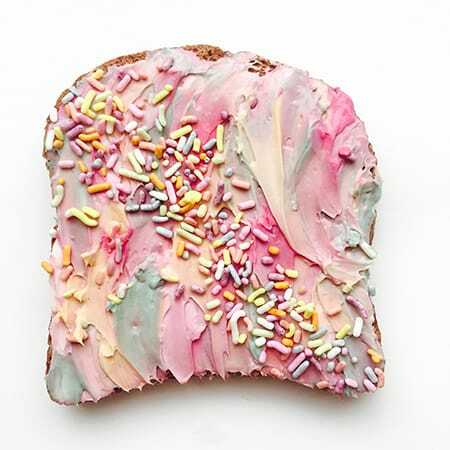 For a healthier option, you can try unicorn toast that is perfect for brunch. 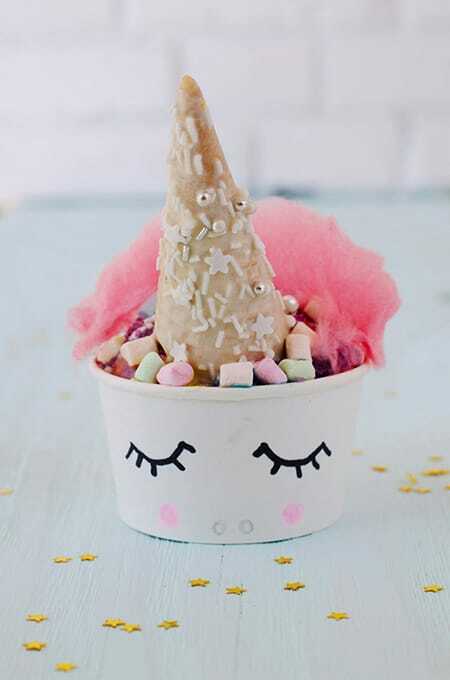 Put a twist on the ice cream cone with this unicorn ice cream bowl. 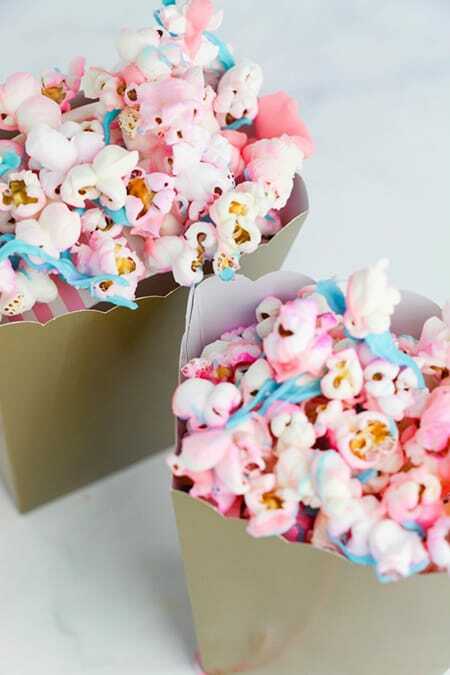 Unicorn popcorn is the perfect treat for a movie night filled with fantasy films. 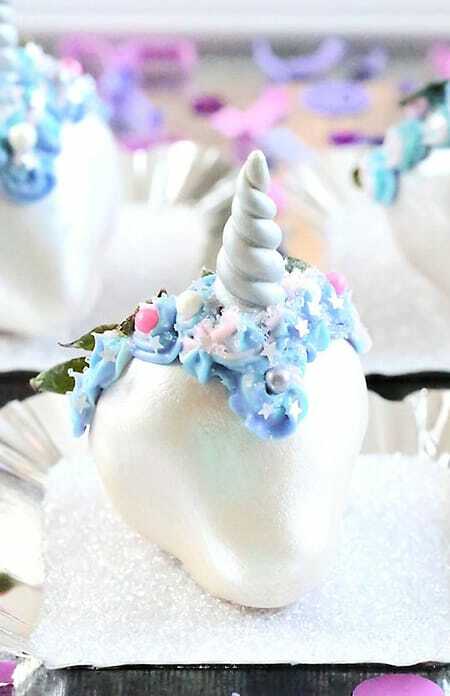 Unicorn chocolate-covered strawberries are healthy and decadent. 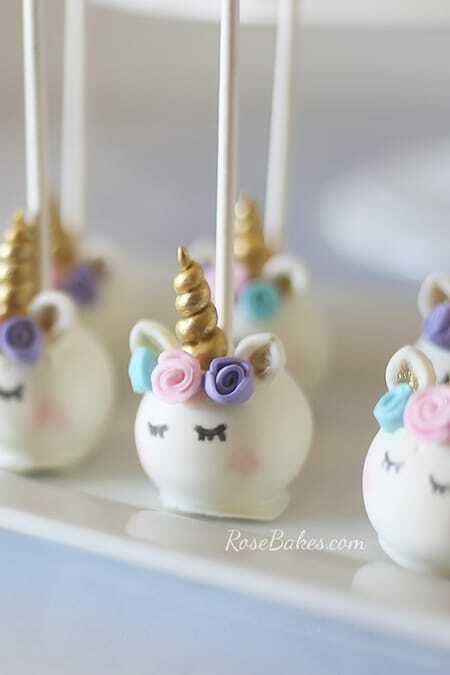 These little unicorn cake pops are the perfect party treats. 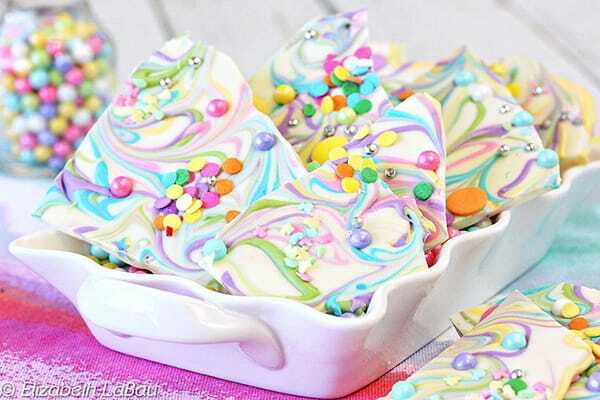 Unicorn bark is colorful, magical, and absolutely delicious. 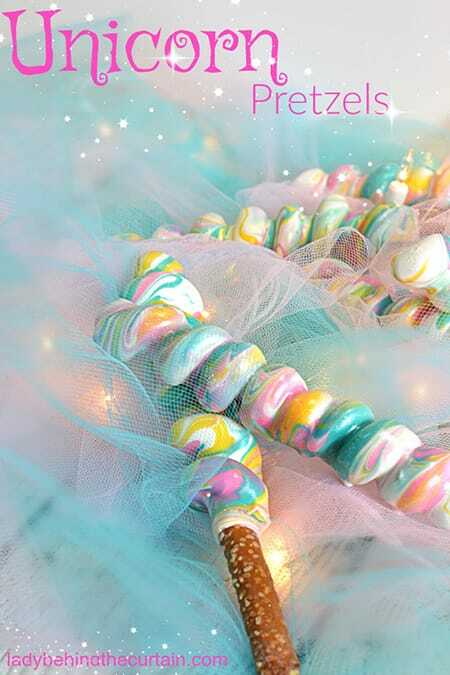 Sugar and sweet go together with these unicorn pretzels. How much fun are these ideas? If you are planning a boy’s party, then you know how important it is to make sure it has a cool theme that he will be proud to show his friends. Kids’ parties are some of the most fun to plan because there is no limit on creativity and possibilities. You can fully embrace a theme. Of course, it all depends on the child’s individual interests. What activities does he love to do? What are his favorite books, movies or television shows? Is there a particular character he looks up to, such as a superhero? Choosing a theme that he personally loves will put you on the path toward a hugely successful party. 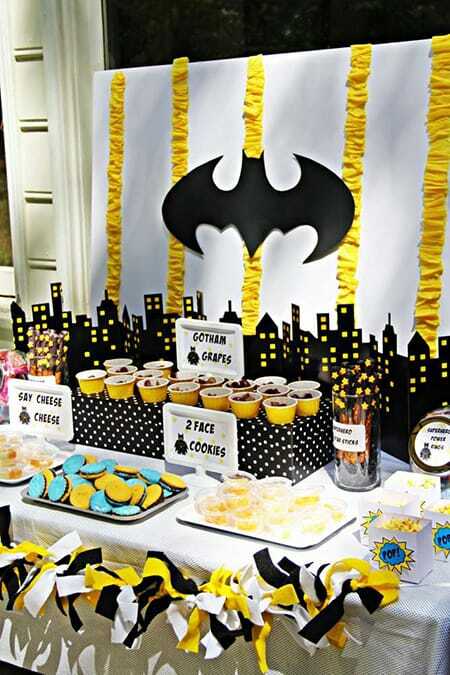 Here are ten fun, creative ideas for a boy’s party to give you some inspiration. 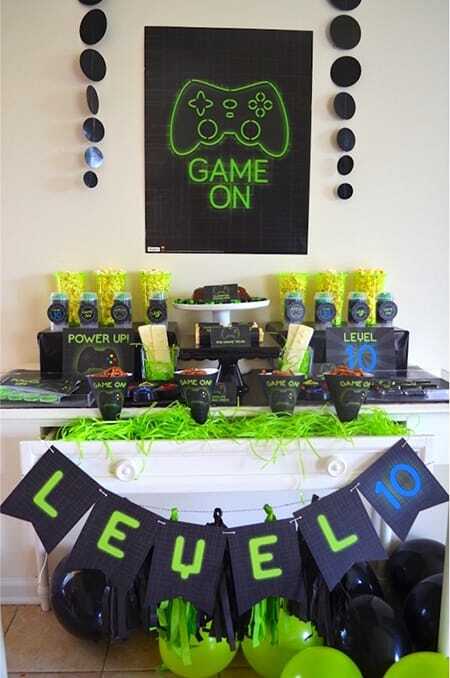 If he’s a gamer, this video game themed party is a perfect idea. What little boy doesn’t want to be Batman? The pops of yellow add a lot of fun to the theme. 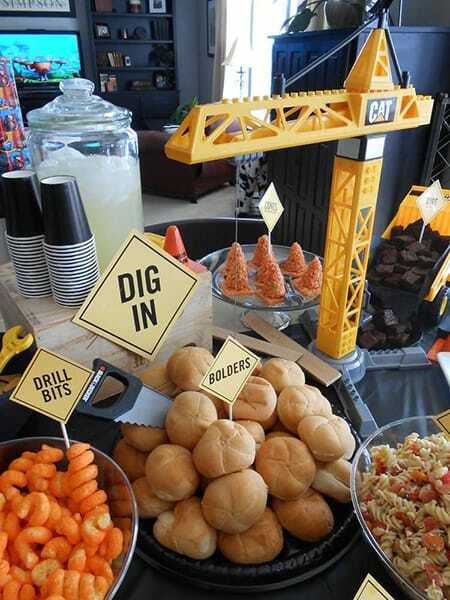 This construction-themed party puts a fun twist on some classic treats. 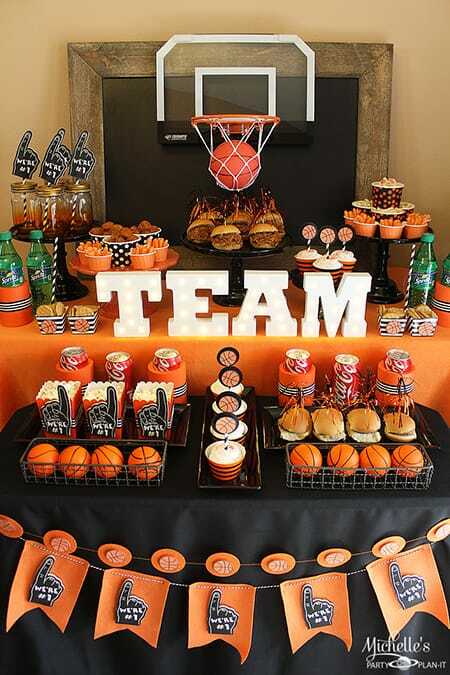 Embrace his love of shooting hoops with a black and orange color scheme and game-day treats. 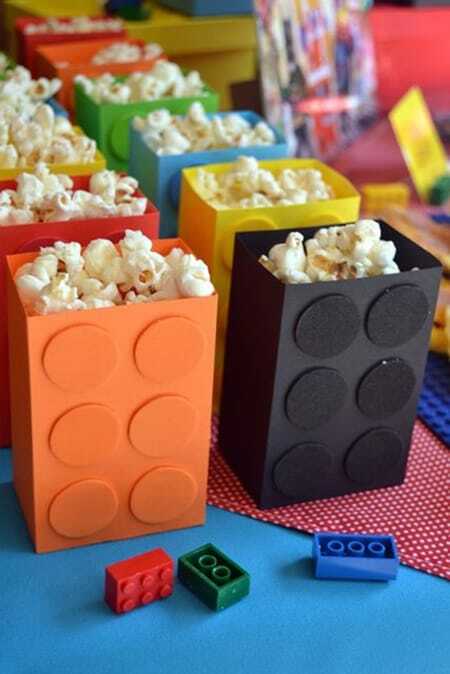 How cute are these DIY Lego-inspired popcorn bags? 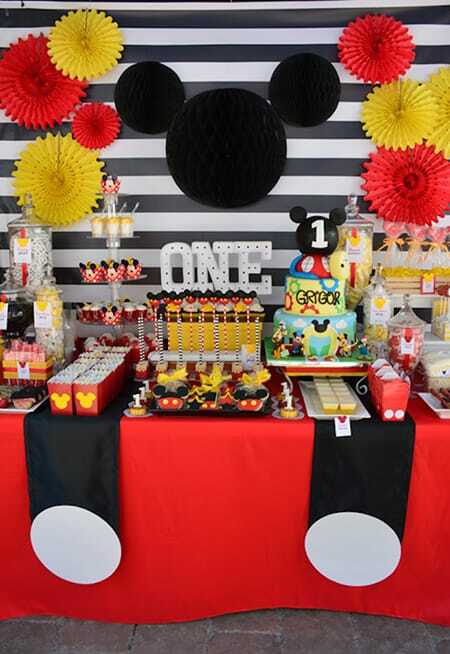 Little ones are sure to get excited over a Mickey Mouse theme in black, white, red, and yellow. 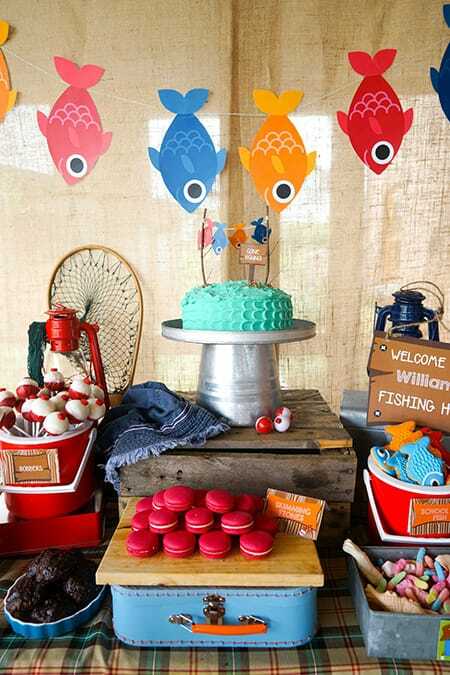 Take everyone “fishing” with this adorable fishing-themed birthday party idea. 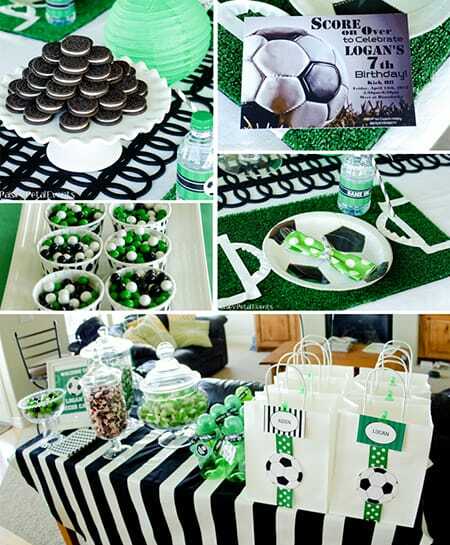 A soccer fan is sure to find this party to be a winner. 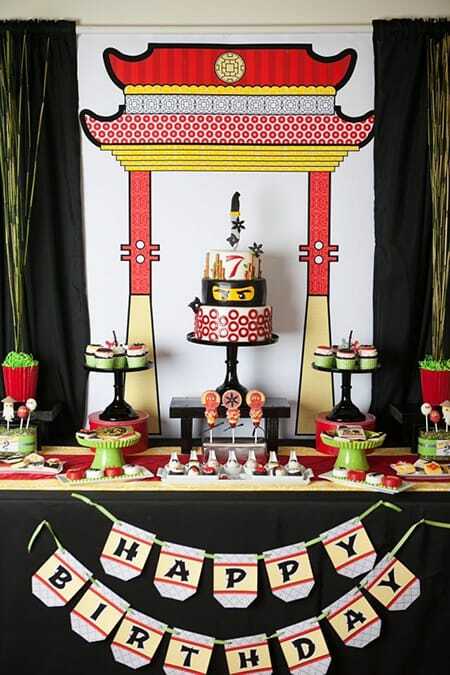 This Lego Ninjago party even includes sushi-inspired cake balls to keep with the theme. 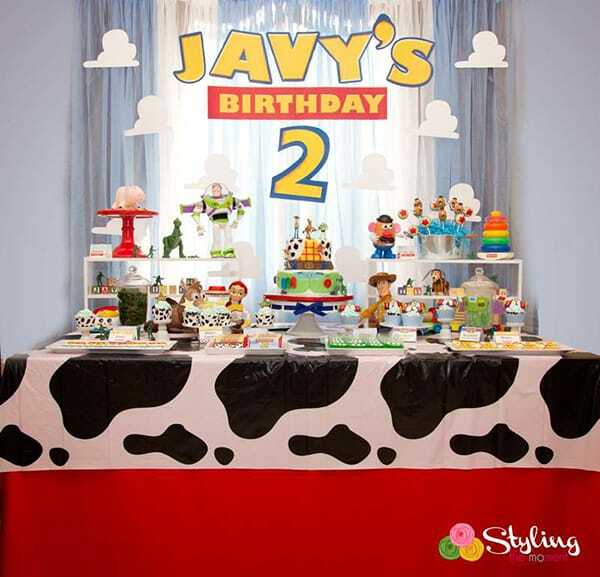 Bring the fun world of Toy Story to life with a whimsical party like this one. If you want to bring some timeless glamour to your home, you can never go wrong with black and gold decor. It instantly brings luxury and drama to a space. Black and gold interiors never go out of style and can be used with a variety of looks, whether you want something modern and minimalist or bold and extravagant. The pairing is very versatile while always maintaining that glamorous edge. While black and gold decor has never gone out of style, I’ve seen it popping up more and more in interiors lately as the trend toward glamour becomes more prominent. The cool thing about black and gold is that you can easily accent it with other colors and change it up as your tastes change, or simply to freshen things up every now and then. Here are 10 black and gold interiors that show how stunning this pairing can be. Modern furniture gives this dining room a minimalist look while the black and gold palette brings some glamour to it. Southwestern design gets a glamorous twist with accents of gold against the black and white. The black table and black area rug provide a brilliant contrast to this white kitchen, while also helping define the eating area in a creative way. A black accent wall is chic and dramatic, especially when contrasted with a white sofa and gold accents. 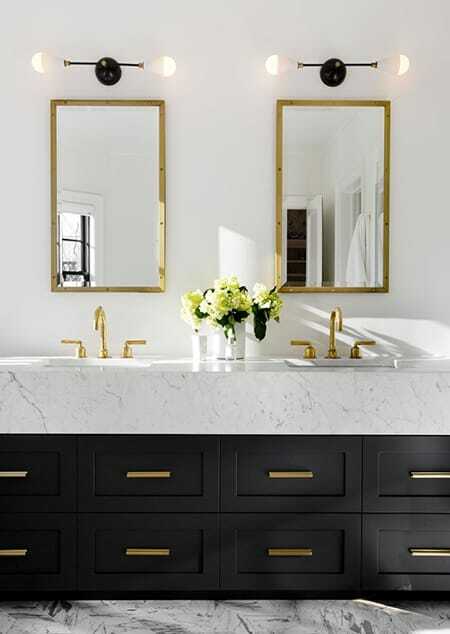 White marble looks beautiful against black cabinets and gold hardware for a glamorous, contemporary look. A gold four-poster bed makes a stunning statement in this simple, elegant bedroom. Simple lines are made dramatic with the stark contrast of black, white and gold. 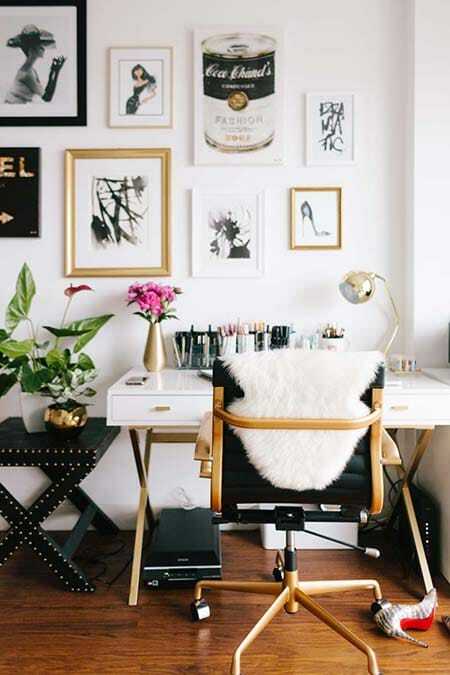 This workspace serves as the perfect inspiration with all its style and glamour. 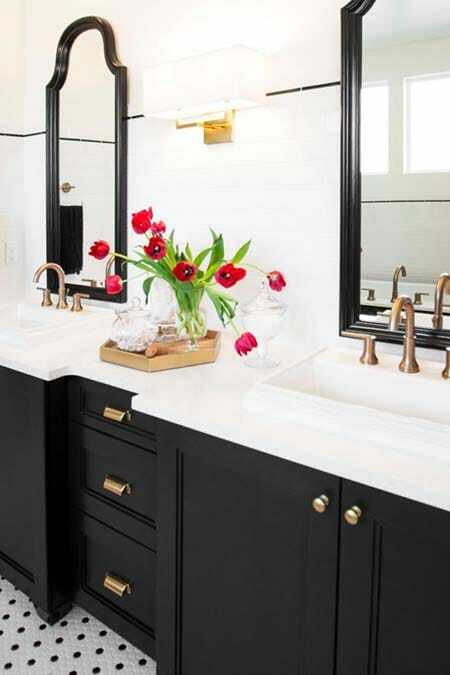 This bathroom is simple but chic with a timeless black and white color palette, given a little touch of glamour thanks to the gold accents. This chic entryway makes a great first impression with a gold console table and black floors. Love it! Always a classic.